go sell crazy somewhere else: WHERE AM I??? 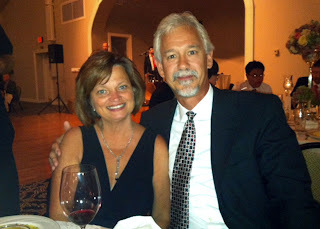 A couple weeks ago, I flew down to Houston, hung out with Mark, and we flew over to Pensacola for a wedding. We thought we'd enjoy the beach for Labor Day weekend. What we didn't enjoy was Tropical Storm Lee. We flew on a tiny plane (which I totally hate) through the nasty clouds, bumping along... in the exit seats, from which I expected to be sucked out from at any moment. I wasn't, obviously, but it really did cross my mind. 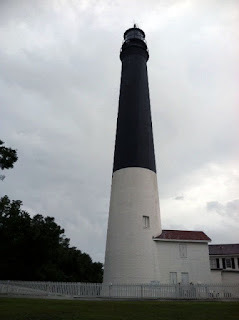 Anyway, we landed in a steady rain, collected our car and luggage and headed out to the beach. As we drove, the weather got progressively nastier. We arrived at our hotel, settled into our room with a lovely view of the tumultuous ocean, crashing into shore under a very dark, windy, wet sky. Ah, lovely. 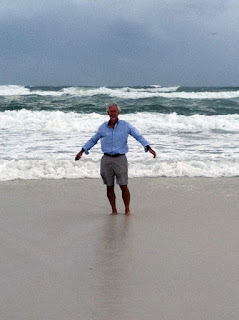 Look very closely, there's a pier in this picture, I TOLD you it was storming. The next day (when we thought we'd hang out at the beach) we took a drive along the coast. 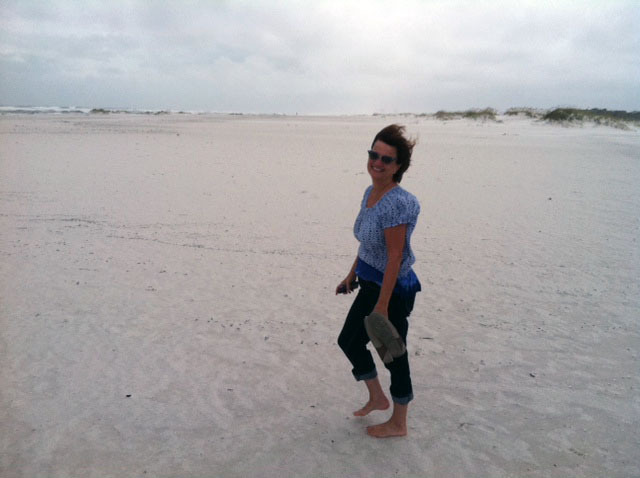 We were actually out on an island of which half was just natural beach. We drove along and met a couple other crazy fools out driving. 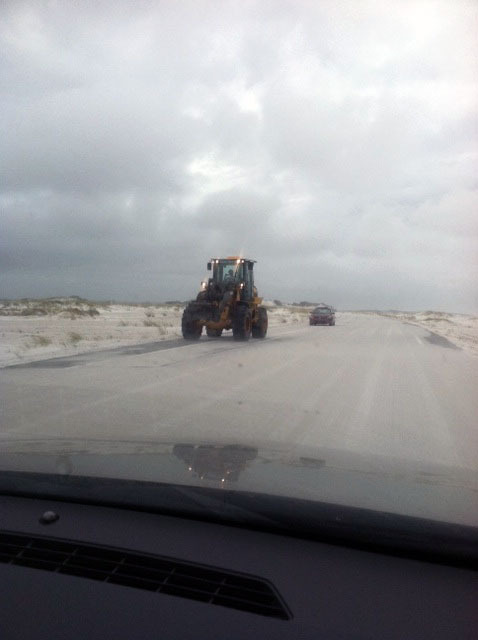 We commented on how the sand looked like snow, then we saw an end loader clearing sand off the road. Reminded me of good old Chicago in the winter. 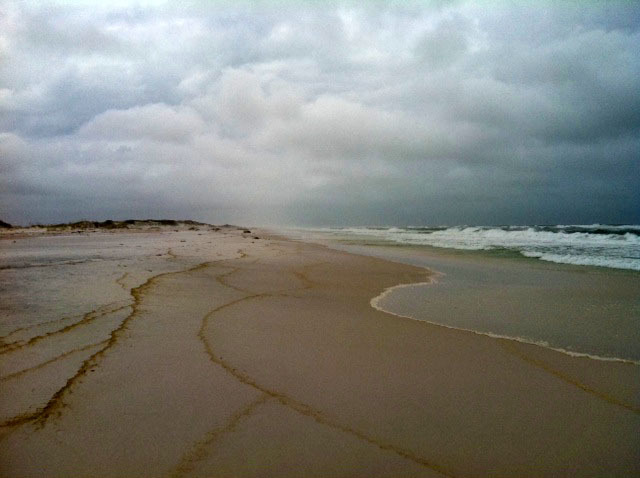 Between storms, we decided to get out and walk on the beach, and get exfoliated. The sand was blowing so badly, it hurt. I had to wear my sunglasses to keep it out of my eyes. It did wonders for my hair. We had a snack at Hooters. Really??? Let's just say, I've been there. Period. The wedding was lovely. And in spite of the 'ugly day, ugly bride' saying, she was beautiful and it all came off splendidly. 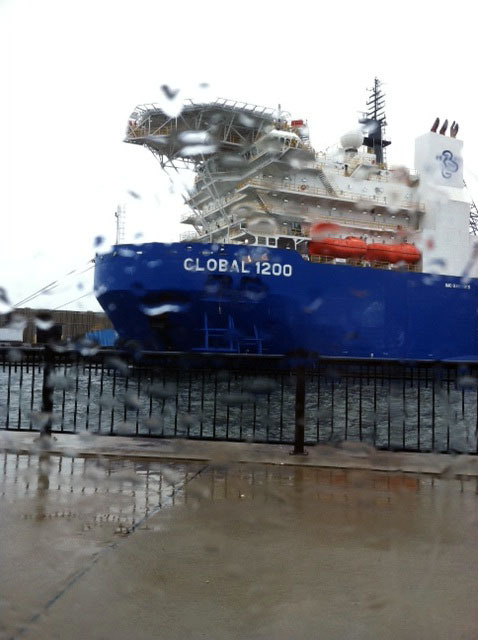 The storm halted for a few minutes for the sword 'ceremony'. After the wedding, the bride and groom came out of the church. A group of sword bearing soldiers assumed their positions at the foot of the stairs along the sidewalk. They held the swords aloft, and the couple walked under them. It was pretty impressive, I have to say. They went back into the church for photos, we made our way to our car, and it let loose with another delightful monsoon. 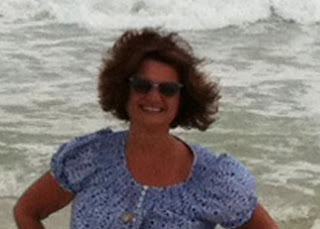 The reception was at the officer's club on the base, and I looked a little like a woman who's been rained on. Pretty cool. The next day, we had hoped to spend basking in the sun working on our sun damage. Not so. 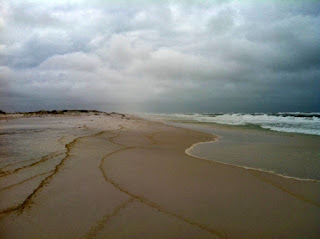 It was still raining, windy and foreboding looking. We attempted to get on an earlier flight. Us and everyone else on the island obviously, as there were no seats. So we had a long wet day ahead of us. 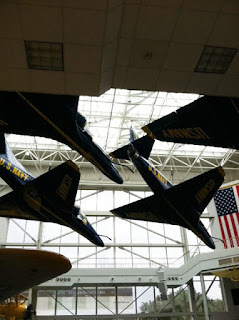 We headed back to the base and went to the National Naval Aviation Museum. I'll admit, I wasn't thrilled at the prospect. But went along. It was really interesting. I enjoyed it! Saw some delightful war clothing (a couple stained with what I am certain was blood spatter), old planes, blimps, fighter jets, space ships... flying things. Did find this display of The Blue Angels interesting. This is an actual formation. Those babies are really close...there will be no mistakes. After that, we checked out the lighthouse.. it was (here's a shock) raining, so I didn't get out, and went down to the harbor and looked at the boats. We did make it out that night. naturally, as we sat at the airport, the rain stopped and out came the sun. Thank you Pensacola. Headed back to the apartment in Houston. It's quite nice, after I did a load of laundry and ran the dishwasher, I had the rest of the week to do whatever. I could get used to this life, I think. We did take a walk over to a park area that had some interesting things. 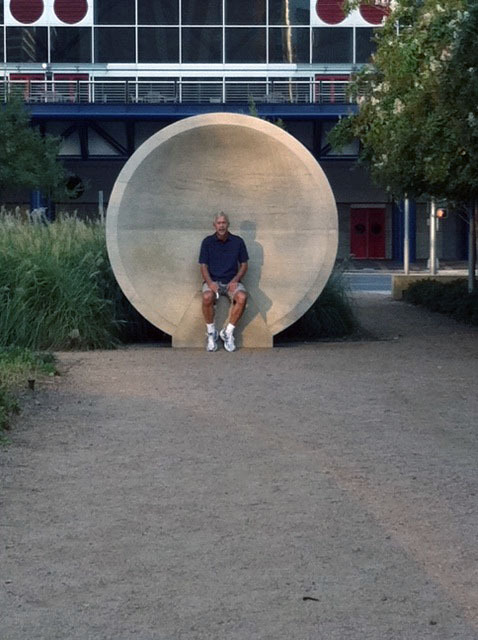 Mark sat in this half shell like thing and I sat in another and we could talk in a normal voice and totally hear each other from that distance. It was brilliant. I need this at home, then I could hear my family. Then again, do I really want to? Flew back to Chicago on my birthday. I had another one... I hate getting old. Did get some nice presents though. Saturday, we went to another wedding. Yep, we are on the wedding circuit. Third one in 6 weeks. It was very lovely too. Another beautiful bride. Sunday and Monday we spent on the boat, after we de-spidered it. Man those little bastards take over when we are gone. Ugh. So that about sums it up... I'm just such a jet setter... you'll probably see me on the new 'Pan Am' TV show. 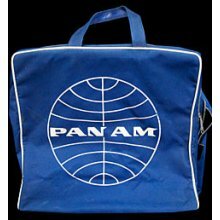 Seriously, we had one of those cool Pan Am bags. I think they gave them to you when you flew with them. That was back when you were treated well when you traveled, AND you dressed up. Now, your lucky to get a swig of pop, and forget the meal... you want nuts, and a blanket? Get real.